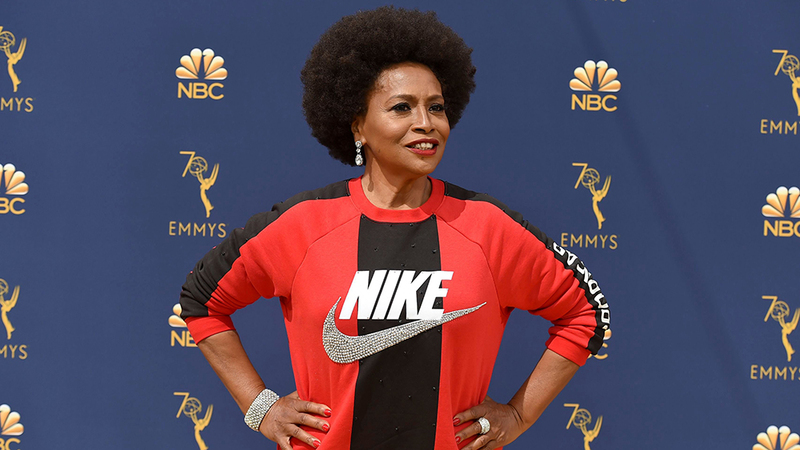 ACTRESS Jenifer Lewis made more than a fashion statement when she walked on the Emmys red carpet wearing a sweatshirt with Nike’s logo on it. The look for Lewis, the “black-ish” actress, came after Nike faced backlash for featuring quarterback Colin Kaepernick as the company’s new face. Kaepernick began a wave of protests from NFL players two seasons ago by kneeling during the national anthem to make a statement against police brutality and racial inequality. The protests have grown into one of the most polarizing issues in sports and prompted a reaction from President Trump, who urged the league to suspend or fire players who demonstrate during the anthem. While Lewis is one of many Hollywood stars standing behind Kaepernick and Nike, others in the entertainment industry like country music singer John Rich have scolded the brand. “I support every American’s right to protest whatever they want. However, if you endorse someone who wears #pigsocks that’s where you lose me. If Nike wants their ‘swoosh’ to be associated with calling our police ‘pigs’ then so be it. I have a right to not buy their products,” Rich tweeted Sept. 4. Also gracing the red carpet early on in the night was RuPaul who spoke with reporters in a white double-breasted suit by Calvin Klein, adorned with a few black Statues of Liberty.